Before we had reported about popular iPhone game "Angry Birds" availability for PS3, Wii and XboX 360. But now it seems that every gaming platform are rotating their way and now you will be soon able to play PlayStation games, apps into iPhone and Android platform. 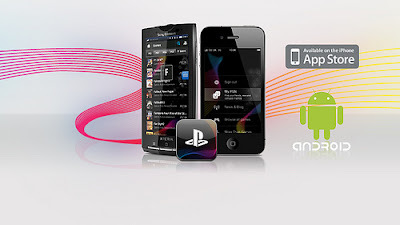 Yes you have heard it correct "Playstation Apps are now coming to iPhone and Android Now". This news was revealed on Official Playstation Blog in Europe, the aptly named Official PlayStation App will make landfall in the U.K., France, Germany, Spain, Italy, and the Netherlands "very soon" and while no mention was made of a North American launch date, I can't imagine we'll have to wait for the U.S. version too much longer. Unfortunately, you won't be able to play Super Stardust HD or Echochrome II on the upcoming app, but at least you'll be able to keep tabs on your PS3 trophy count, as well as what your pals are playing and whether they're online. The PlayStation app will also deliver the scoop on new PlayStation games and hardware, as well as any incoming announcements (such as PS3 or PSP firmware updates or PSN service bulletins) from the official PlayStation blog. Last but not least, you'll be able to share articles on the PlayStation app with fellow gamers via Facebook and Twitter. The new PlayStation app will work on any iPhone or iPod Touch with iOS 4 or better installed, while the Android version requires Android 1.6 or higher. The European wing of Sony's PlayStation division adds that it's "already working" on a new version of the app that will add support for more countries and languages, and that we can expect "tons more features" in the months ahead. The ability to actually play mobile PlayStation games on a phone, however, might end up being relegated to the long-rumored, supposedly Android-powered PlayStation Phone, sightings of which have been popping up on the Web for weeks now. Unsurprisingly, the PlayStation Blog post had nothing to reveal about the mysterious "Zeus Z1" slider, which is said to have its own PlayStation app specifically for mobile games. At least we'll have the PlayStation app and our old PSPs to tide us over until the Z1 or whatever it ends up being called finally rears its head.